The Internet will now be controlled by a handful of companies. Today, a federal appeals court handed over control of free speech on the Internet to a handful of companies. This is why it matters. Say you’re an NRA Republican. You’re from Tennessee. The websites you go to on a daily basis are Yahoo for your email and news, ESPN for your sports, and TNGunOwners.com, a message board to talk about your day at the range. What if one day your access to your email is fine, your Tim Tebow coverage from ESPN is as loud as ever, and TNGunOwners.com inexplicably took 4-to-6 times longer to load? 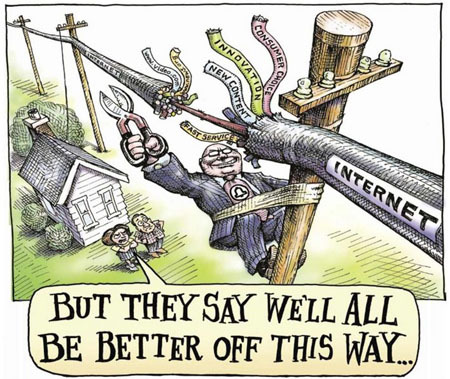 What if you called your Internet service provider and their answer was, “That’s just the way it is now”? Say you’re a Whole Foods-pillagin’ Democrat. You’re from Portland. You go to GMail for your email, MSNBC for your news, Reddit for your cat videos, and an indie music blog likeSaid The Gramophone to find your music. One day, your access to Gmail is fine, your Rachel Maddow clips are coming in clear as day, and that YouTube video of a cat taking a bath on Reddit is rolling along smoothly. But it takes so long to load one song from that indie music blog you just turn on the radio. Say you’re entirely apolitical. It doesn’t matter where you live. You’re struggling with depression because it’s hard to cope with your mother’s recently diagnosed cancer. You go tocancerforums.net. You go to takethislife.com for help, when you can’t read the cancer forum anymore. A federal appeals court ruled that the FCC can no longer enforce which websites Verizon and all other broadband providers can favor, limit access to, or outright block — even if it’s to prop up a service or website of their own. This is not a binary political issue. It is not a Republican or Democrat issue. This is naked corporate greed. It is a bunch of companies who want to control the largest free information platform in the world. There is nothing good that an individual can derive from this decision. Nothing. Before someone tells you otherwise, Internet service providers’ backs were not against the wall in any way. “Bandwidth congestion” is not real. It costs just as much money, if not more money, to cap the data flowing through your broadband connection as it does to serve it to you. Data caps are solely a money-making construct. 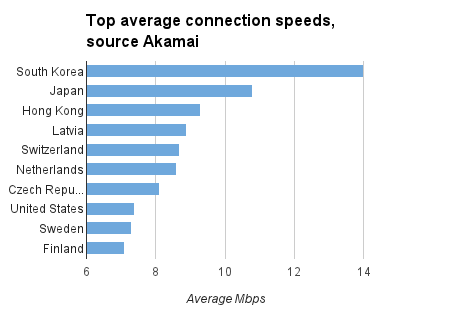 Average connection speeds in South Korea are twice as fast as those in the United States. That gap will grow even wider now. This ruling is anti-competitive for American business on a global level. Tech giants Google, Facebook, Amazon, Netflix and Yahoo have come out against rulings like this in the past. Instead, the decision favors companies with access to pipelines, like Comcast. It will help them use the Internet as a marketing tool for its other ventures, like NBC Universal. The very best scenario a consumer can hope for is this: Companies will start offering “unlimited” Internet plans to access the Internet you currently see today. 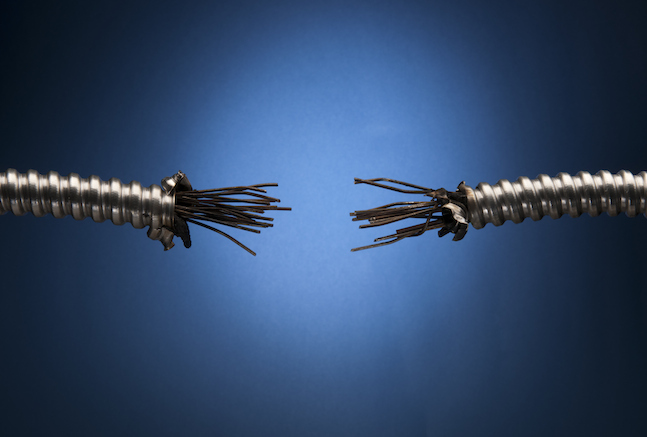 The Web will be partitioned off into sections, like cable tiers, and those ISPs will offer speedier connections to certain kinds of websites if you buy into each tier. The very worst a consumer can expect is that some information will be deemed too unsavory for public consumption, while select corporate messages can be blasted to your home at lightning speed. This is not a political story. This is corporate greed at its most blatant and obvious. Call a Congressman. Get a law passed. Override the better lawyers, the lobbyists, the bought Congressmen. Do the impossible. It’s the only way. This entry was posted in civil liberties, economy, law and tagged Ben Collins, broadband providers, Esquire, FCC, free speech, internet, internet service providers, net neutrality, Verizon. Bookmark the permalink. Thanks for posting this important information. Good timing as we enter the two weeks to the Superbowl and massive distraction.